This has been a pretty crazy week for us. You know how sometimes things happen when you least expect them. It was one of those. So we’ve been in the app store for a couple of months and we were getting some organic traffic everyday but nothing too significant. I was also going to a lot of meetups here in LA trying to get the word out about the app. I was getting pretty good feedback from everyone who saw the app. That was encouraging but I wanted to do be able to tell our story to a bigger audience. Press obviously is the first option that comes to mind. I tried reaching out to a few tech journalists/ bloggers but it was really hard to get their attention. It’s understandable though. They must get tons of requests everyday and it’s impossible for them to look at each and every app that is sent to them. So that approach wasn’t working out. We even considered hiring a PR firm but after talking to a few people we realized that PR was not going to be effective, atleast in the initial stage. We had to build some organic growth. This week, I just casually submitted the app on Product Hunt. It’s basically a platform that features new tech products every day. The way it works is, new products are submitted to them every day. They handpick the products and feature them on their home page and then their community upvotes the products they like and the best products get surfaced every day. They also send out their daily newsletter with the top 5 products from the previous day. I had signed up for their newsletter when they were still pretty new and being a product person myself it was good to constantly see all the cool stuff people are building. So yeah I submitted the app to them on Tuesday. I honestly wasn’t expecting anything. But I woke up the next day and I had an email in my inbox from Nichole (their community manager) saying you’re trending on Product Hunt so go jump into the comments. I was like what!?? And then things just got crazy! We started getting upvotes and comments from the founders and CEOs of some famous startups, product managers at some top product companies like Apple and Nike, designers, developers and some other tech influencers. These are people who build amazing products that we use every day. So their feedback really mattered. - A ton of emails with feedback, suggestions for features and requests for the Android app. We could not have asked for a better opening. 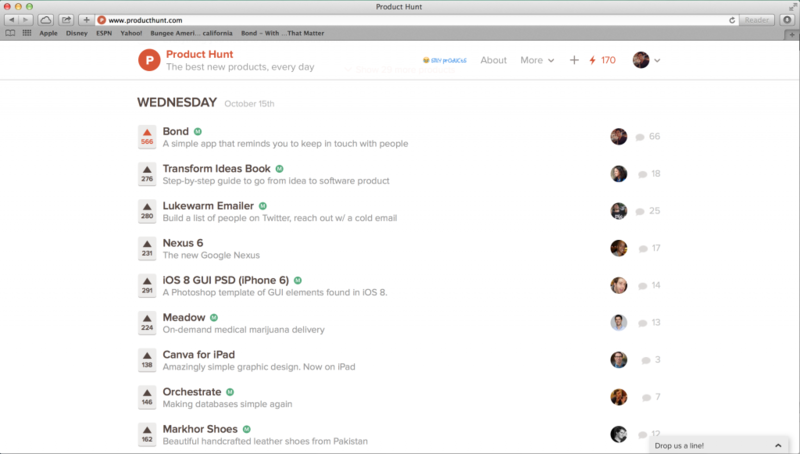 I can’t thank Ryan Hoover and his team at Product Hunt enough. I think they have done an amazing job of building a solid community of tastemakers who help surface new products everyday. It really helps founders like myself to get our products in front of the right audience. I just got my daily inspirational quote and it couldn’t be more fitting.